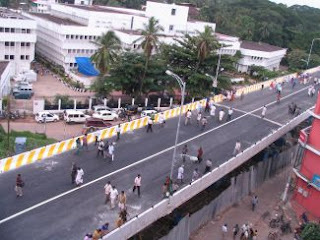 Story: Bakery Junction flyover inaugurated in Trivandrum early this week. The ubiquitous no of street-smart cyber-journos in Trivandrum makes sure that the event is covered well and published like instant coffee! Full set of pictures at Ajay's Trivandrum Rising as usual. Credits: This one belongs to whom? The picture below may help, courtesy @jlusujith. The flexboard on the left heralds the Right stalwarts as the 'architects' of the Capital Road Improvement Project in 2003 and the board on right featuring the happy Left CM claims credits for 'finishing' the job. Confused? Factfile: Half a kilometer long, 2 laned flyover. 5 years in making. Juxtapose: Bangalore and Hyderabad completed nearly 2 dozen flyovers and underpasses in the last decade. Not bringing in Chennai or Delhi here for comparison because it'll be an insult. Apart from the Bakery Flyover only two similar projects were fructified in Kerala, one being the Palayam underpass, an extended appendage of the Bakery flyover and the other, the Arayidathupalam Flyover in Calicut. Background: The TRDCL project was initiated by the Antony Govt in 2003 after public pressure against the zero-development in infrastructure in Trivandrum. A total of 42 km of roads were to be developed including one underpass and 2 flyovers. The idea was that the total project amount will be dispensed in 3 installments through allocations in the state budget. Punj Lloyd won the bid, commenced the work. But the global conglomerate had to fill hours scrapping the rust off their heavyweight machinery because the authorities failed to acquire and handover the land required for road works. So they packed up and left North. Hold on...This is not the end of it all. There is another one proposed over the MG Road connecting Power House Road to Thakarapparambu Road. The Minister joked that the works will be over by 2011 October, ya, in another year! lolz, this one involves relocation of scores of big businesses including the Big Bazzar shopping center and major shifting of utilities. The 3-year Capital Development Project is going to spill over into the hands of the 3rd successive Government! Given the 5-year plan we saw with Bakery Jn project, there is no guarantee that a motorcycle would cross over the Powerhouse Road flyover in 2016, unless its equipped with jetwings. A lot of good works have been done, we have to appreciate that. Even though there have been ZERO new projects to develop any new roads within the rapidly developing cities. Even though Mr. Vijayakumar is heralded as the patron-saint for Trivandrum the other road development works outside TRDCL are still stuck exactly where he took over in 2006. Did he think that there was nothing else to look after apart from the 42km stretches included in CRIP? In 2001, Trivandrum had 3000 souls working at Technopark. 10 years down it is touching 30,000. The NH Bypass which was a dream track for race-freaks, now see bumper-to-bumper traffic at peak hours. The Ulloor- Sreekaryam Road is just unbelievable! Still a modest 2 lane road holding 6 lane traffic, this is the lone way to reach the Medical College for ambulances and emergency vehicles. Widening of a 5km road connecting Ulloor- Akkulam with NH Bypass, which commenced in 1999, still hasn't gone one step further. 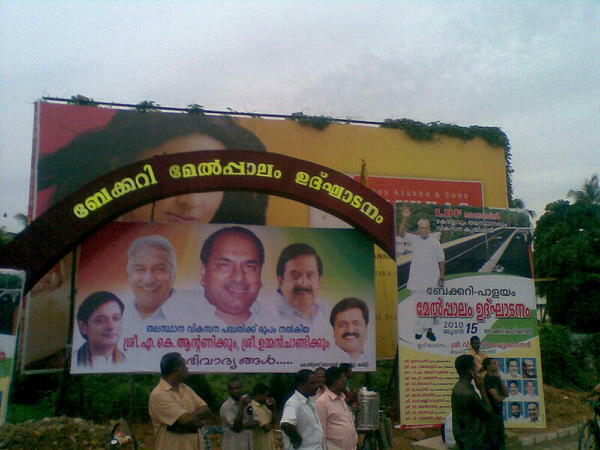 Everyone forgot the MC Road works until Nalanchira for 4 years but suddenly some people got a brainwave from nowhere. 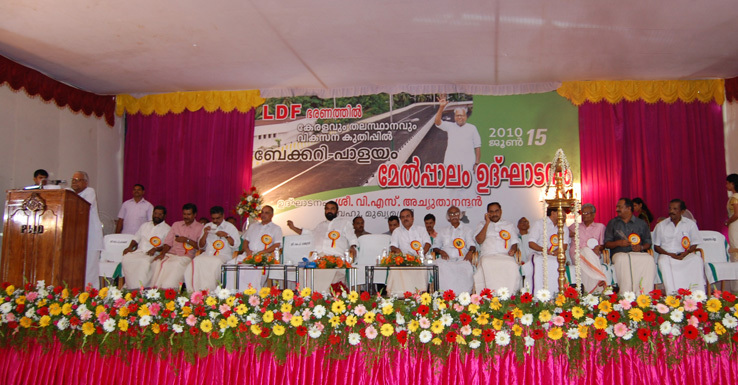 The only other project which appear promising is the 6-laning of the Karamana- Kaliyikkavila stretch of NH47. Here again, the onus of land acquisition falls on the State Govt. One of the busiest and congested stretches of highways in Kerala; its anyone's guess when the actual road-works would commence. The reason I hear is that 'we are special'. Special in what sense? Be it highway development, city roads development, flyovers and underpasses, IT Parks or SEZs, the excuse is that 'Kerala is a special case'. Special in population density, they say. A mere glance at figures from elsewhere cripples that argument. 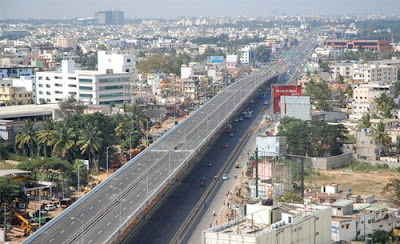 Bangalore planned and built a 4 lane 9.5km Electronics City Flyover in 4 years. The 11.6km P.V.Narasimha Roa Expressway in Hyderabad passes over the most congested parts of the huge metropolis. Chennai and Delhi puts us to shame with the no of flyovers, underpasses and roads they build every year. Bangalore's population density is twice as that of any Kerala city, so that's not where the shoe pinches us. When you look at the rehabilitation packages for evictees things become clear. People are sent packing by paying them a small fraction of the existing market rates and this embroils down to agitations, political foulplays, court litigation and so on. How many times have we seen this happen. Look at the Trivandrum International Airport and things become more clear. The landmark terminal is ready for commissioning, but the land needed for the next phases of development is yet to be acquired. There appears to be no honest efforts to get the land in Govt's possession and hand it over to AAI. This is extremely crucial for furthur expansion of the Airport and also for the crucial Cargo Complex. But our leaders appear to act napping whenever someone mentions it. The same reason why we see 'all-party delegations' leave for New Delhi to bring in collateral damage. Perhaps we must look back at history to see how the volatile issues related to land acquisition of VSSC in Thumba were sorted out diplomatically, including St. Martin's Church on the 600 acre grounds. A few tombstones are in the way of Airport Road in Pattoor for a Jupiter-year now, and the living souls pay the price. We know what we lack: a clever futuristic leader with a straight spine who genuinely cares for the future of our state. In 2020 Chandigarh, Pune, Mangalore, Surat and Mysore would've had their infrastructure issues sorted out in a big way. Trivandrum, Cochin, Calicut and Trichur will still be crawling its way through, consuming decades building half-mile bridges. Kerala is a 'special' case, so be it.